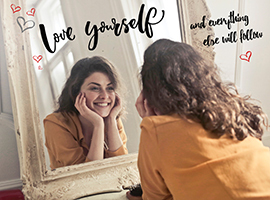 Loving ourselves is truly the key to moving forward in life with more ease. Learning to let go of inner dialogue that keeps us small and no longer serves us. While worrying about the past and the future, we miss the present and the gifts it offers us. This week I share a beautiful poem read by Charlie Chaplin on his 70th birthday (April 16, 1959); originally written by Kim McMillen. I find it inspiring and helpful in reframing old patterns of thinking. My hope is this poem helps you find some comfort, awareness and move you in the direction of your deepest authentic self. And you know, I am here to support your journey too. As I began to love myself I understood that at any circumstance, I am in the right place at the right time, and everything happens at the exactly right moment. So, I could be calm. Today I call it “SELF-CONFIDENCE”. As I began to love myself I recognized that my mind can disturb me, and it can make me sick. But as I connected it to my heart, my mind became a valuable ally. Today I call this connection “WISDOM OF THE HEART”.